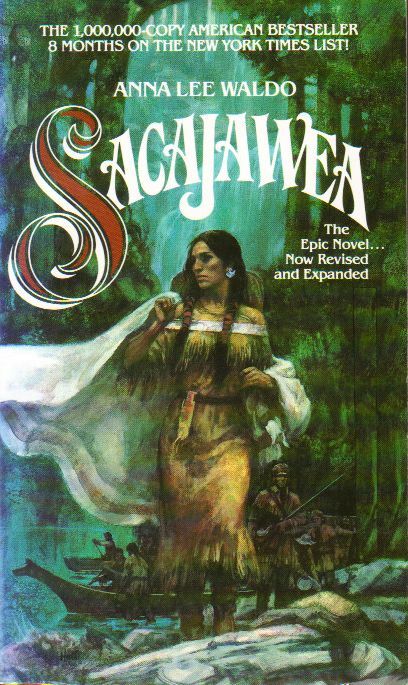 The beginning of the book SACAJAWEA deals with this young Shoshoni girl's homelife, the death of her grandmother, her capture and being a slave to the Arikaras. She is won in a game of Hands by a French-Indian trader, Toussaint Charbonneau; who is living with several young Indian women. When Charbonneau meets with Lewis and Clark at Fort Mandan, he explains the advantage of having a Shoshoni-speaking member in their party. In the end Charbonneau refuses to join the expedition as a translator if one of his three women is not allowed to go with him. Clark agrees even though Sacajawea is pregnant at the time. As the Expedition gets underway Sacajawea begins to be appreciated by most of the members. They turn to her for advice on edible roots and berries, to mend their clothing and when they come to the Lemhi Pass and Shoshoni country she points out several landmarks. She is not a guide as some people believe. After all would a military contingent, especially at that time, 1802-5, let a young Indian woman tell them where to go? Her knowledge of the local area where she had been a child was a great asset. Unquestioningly, it was her presence, with her papoose strapped to her back, that indicated to hostile Indians that this was no war party. Lewis and Clark and their men fulfilled President Jefferson's dream of finding a gateway to the Pacific, mapping out the Missouri River, the Shining Mountains and beyond. Sacajawea fulfilled her dream of being reunited with her family and friends from whom she had been so violently wrested. She did not remain with her tribe, but stayed with the Expedition. Here the feelings of friendship between Captain Clark and Sacajawea began to grow. Back in St. Louis, Charbonneau openly brought home a few young Indian women to satisfy his desires. Sacajawea left Charboneau and traveled south to Oklahoma Territory where the Comanche lived. With the Comanche she found love with a man named Jerk Meat. When Jerk Meat was killed on a horse raid she leaves and travels north looking for her first-born son, Baptiste Charbonneau. Several times mother and son cross paths, but never do they find each other. Sacajawea dies on the Wind River Reservation in Wyoming. This nearly one-hundred-year-old woman knew much more about the way the pale eyed, white skinned people lived than most Indians. She told stories about traveling with many white men, whose names she knew. She called the leaders Captains Lewis and Clark. A Wind River missionary believed she was truly Sacajawea and made certain that a large headstone was placed at her gravesite, instead of the common iron bedsteads that surround many of the Indian graves. That large headstone is still in place on the Wind River Reservation. The background to the SACAJAWEA story is authentic as possible, but I do admit to making up part of the story where facts do not exist, such as conversation etc. I believe this actually enhances Sacajawea's development from the age of eleven to almost one hundred years old. Her birthplace and date, life span and date of death, pronunciation, spelling and meaning of her name is still a point of controversy.